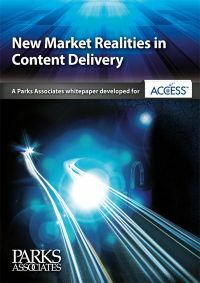 A new Parks Associates white paper, "New Market Realities in Content Delivery", looks at the security challenges that need to be faced before multiscreen is ready for primetime. Parks comments that "in an arena where content has seemingly ruled, consumers, instead, are the driving force." The paper looks at how security and multiscreen interacts for operators, the content industry and the consumer. A key finding in the Park Associates paper is that "Smart TV manufacturers will hold a prime seat at the table if they develop a future- proof roadmap that allows for affordable upgrades to their own technology." To download the Whitepaper "New Market Realities in Content Delivery", please fill in the short form on the right. Fields marked with and asterisk * are mandatory. Please make sure that your email address is correct as we will directly send you the PDF download link. Parks Associates Multiscreen white paper. Mandatory field Human? * What is the sum of 4 and 4? What is the sum of 4 and 4?